Don’t you just love paper chains? You remember making them as a kid and the satisfaction you get when you see them getting longer and longer? We have been making a lot of elastic bracelets and we just have a pile of them. I was playing with them one day, and discovered that they make really nice and colorful chain links! 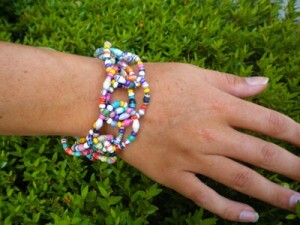 We made several of the elastic bracelets using small round beads and small olive shaped beads. This style of linking the bracelets into a chain is so versatile and a lot of possibilities. 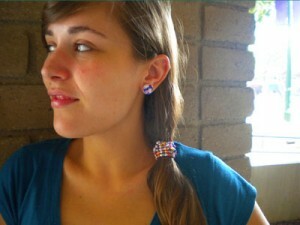 Because there is no clasp involve, you just tie them with a ribbon for closure you can wear them several ways. This would also be pretty as a belt. 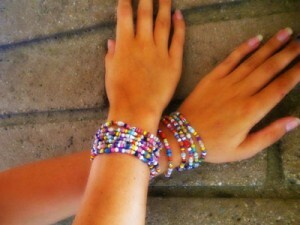 The same necklace, we converted it into a bracelet. I think it would work great as a head band also! Upcoming posts: More updates on the Paper Bead Trade, Crochet with paper beads and Simple Wire Wrap for Shell Pendants. This is reallly cute. I am going to try it. Thank you!